The W hotels Rock Tea which is inspired by rock albums and songs such as Pink Floyd's Dark Side of the Moon and Fleetwood Mac's Go Your Own Way. Gizzi Erskine has created three brand new sweet treats to the collection: Wild Things, a salted caramel and popcorn eclair; Rockabilly Rebel, a devil's food cake with peanut butter mousse and peanut brittle and Flipsville, a cherry cola and yuzu tart. 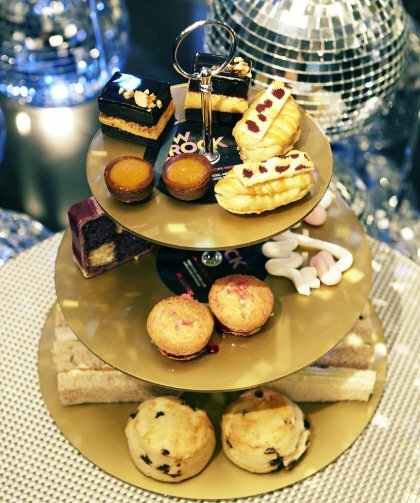 The new tea has also achieved gold disc status, with the three-tiered cake stand made from original vinyl records plated in gold - the perfect rock' n' roll centrepiece. The W Rock Tea remixed by Gizzi Erskine will be served in the W Lounge at W London – Leicester Square between 2pm-5pm daily from 26th March 2013 for a limited three-month period and costs £25 per person. For more information or to book, visit www.wlondon.co.uk or call 0207 758 1060. 'Skinny Weeks and Weekend Feasts' is available at the W Store and all good bookshops. For any information on allergens - please ask.